Stronach Stable's Queen's Plate winner Holy Helena has settled in at Jimmy Jerkens' Saratoga barn in good order and is likely to make her Spa debut in the Grade 1, $600,000 Alabama on August 19, her trainer said on Friday morning. Jerkens added that the Ontario-bred Ghostzapper filly is expected to work in the coming days. Last Saturday, she breezed a 50.33-second half-mile on the Oklahoma training track, her first work since she beat males with a 3 ½-length victory in the Queens Plate on July 2 at Woodbine Racetrack, the second leg of Canada's Triple Crown. 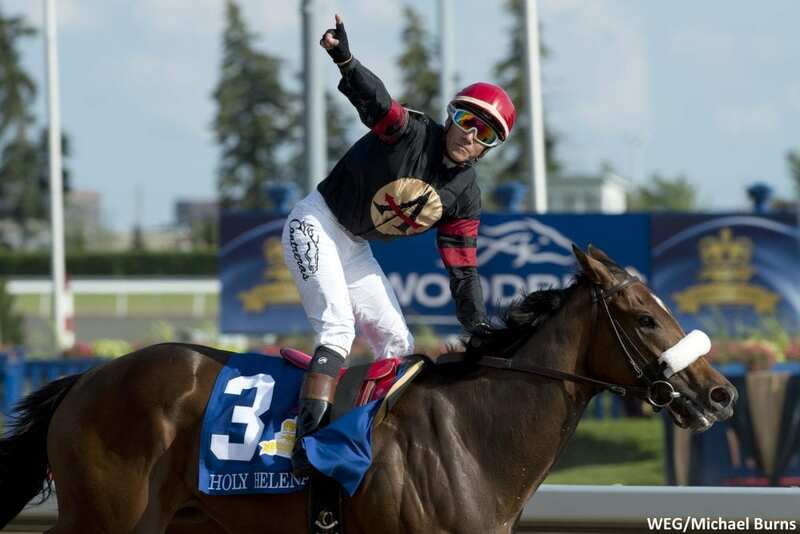 Unveiled as a 3-year-old this spring, Holy Helena broke her maiden at second asking on May 12 over Belmont Park's main track and has gone on to register back-to-back stakes wins on Woodbine's Tapeta course, winning the Woodbine Oaks on June 11 prior to taking the Queen's Plate at the Alabama's 1 ¼-mile distance. Jerkens said that multiple Grade 1 winner Shaman Ghost will train up to the Grade 1 Woodward on Saratoga's closing weekend. Also by Ghostzapper and owned by Stronach Stables, the 5-year-old bay horse got back to the worktab for the first time since finishing second to Keen Ice as the 1-2 favorite in the July 8 Grade 2 Suburban, covering three furlongs in an easy 39 seconds last Saturday. Graded stakes-placed Dolphus won't make a start at Saratoga this summer following a tendon injury suffered during training recently. The 4-year-old half-brother to 2009 Horse of the Year Rachel Alexandra was nominated last week to the $100,000 Alydar on August 6. This entry was posted in Racing and tagged Alabama Stakes, dolphus, Frank Stronach, ghostzapper, holy helena, jimmy jerkens, queen's plate, saratoga, shaman ghost, Stronach Stables by NYRA Press Office. Bookmark the permalink.